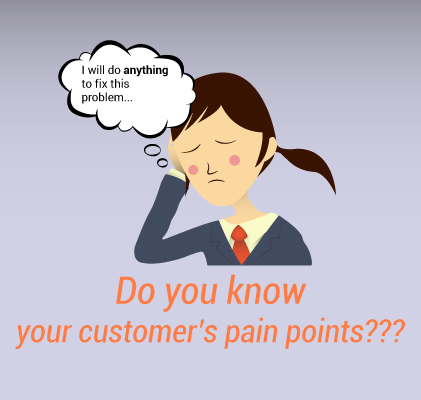 Have You Identified Customer ‘Pain Points’ for Your Products? People spend their money on the 2 most important things: to reduce pain and to increase happiness. So, it’s like the worse the problem is, the more chance you have to sell your solution. The better your solution is, the faster your customer will pay. So look for situations or things that people find disturbing, uncomfortable or frustrating, focus on a ‘perfect problem solving solution’ for that and this will help you to guide your products or services to make their pain go away and improve their lives. In simple terms, pain points are ‘cries for help’. The best way to understand the pain is to put yourself in their shoes. When you will be able to understand the issues they are facing, only then you can offer your solutions which will solve their problems and improve the client experience. Let’s take the example of WhatsApp. It did something that telephone service providers should have done much before but didn’t. For instant messaging, previously we used to send SMS but why to waste money on SMS when we have unlimited data plans? WhatsApp then fixed the problem. It allows users to send unlimited messages, videos, audios, images over the internet, so it easily bypasses the other phone carriers who would have charged extra to send texts over their network. In the sales and marketing industry, you will get a lot of advice about understanding a customer’s pain points. Their needs for your product actually lie in their pain points. So try to focus on it for offering the best solution and to improve customer experience. Without finding out the problem, selling your solution will be very difficult. Try to list down all your customers’ pain points which will help you to understand their desire. Referring to those during your promotions, advertising campaigns, in your one-to-one meetings with your clients will help them to relate to your products or services and improve the client experience. Try to build a good and healthy relationship with your customers so that they can share their problems with you. One-to-one meetings with your sales and customer support personnel who directly deals with customers. One-to-One customer interviews to understand their problems in a better way. Review of customer service calls and chats to identify the most common problems they face and improve customer experience. Assessment of what other competitors are offering is required to understand whether their products are better or not. Take suggestions from other stuffs of your company. Generate customer focus groups: a good market research process where your customers can participate in a discussion with other customers. The group discussions are normally moderated by an independent facilitator. Creating content like blogs or different posts, attracts our target audience and helps to get new leads and customers. But you should understand that your targeted customer may be searching for some different piece of content. For example some of them may want podcast so that they can listen while driving or doing other things. So try to find want what your customers want and provide it as per their wish. Try to use the same language your customers use in your marketing collaterals. It will help them to relate with your offerings. If you know, what your customers are looking for, you can help them out to find it. Your marketing messages can be tailored to fit the different client profiles if you know their objectives. It goes hand-in-hand with the customization of your content. Even if you offer a service that can be benefitted for your customers, but they will not buy it if it’s not packaged in such a way that related to them. So try to put your offerings together for serving your market. Don’t forget one thing! If you genuinely desire to serve your target audience, you will definitely produce the best solution for them.